Baty International is one of the world's leading manufacturers of Optical Profile Projectors, Co-ordinate Measuring Systems and Gauging Products. Building on decades of experience in non contact dimensional measurement, Baty International has offered camera based (vision) measuring systems since the early 1980's. 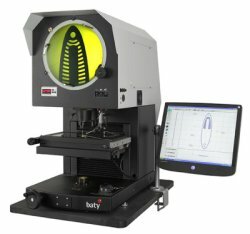 The Baty Venture addresses co-ordinate measuring using modern zoom optics systems and high resolution colour cameras, supported by a fully integrated touch probe facility for measuring those points that are hard to see. The Venture Range combines easy to use feature packed software with sound 3D mechanics and precision optics to produce a 3D multi sensing vision system at a price never before achievable. We have an extensive range of products from basic comparators right through to fully automatic optical non-contact measuring systems. Applications range from machined metal parts to laser cut ceramics and semiconductor components. With a worldwide network of fully trained, authorised distributors, Baty International provides full after-sales service and support second to none. Baty International has been a major British manufacturer of Dial Indicators and Gauging Products for over 60 years. The product range covers a wide variety of inspection, shop floor and tool-room applications. The manufacture and/or inspection of automotive parts, lenses, paper and packaging as well as a variety of civil engineering applications illustrate the versatility of this equipment.